So I set about looking for a design. I searched the net and looked at many a mirror but none caught my eye. Then it dawned on me that we had an American Chippendale mirror hanging in our house. Why it took me so long to make the connection I don’t know. I studied it some and realized it was much more pleasing than any I had researched. Better yet there is a story behind this mirror. In that moment of realization a reproduction effort was born. The original mirror is an American Chippendale mirror made sometime in the late 1800’s. My wife received it from Marguerite Emily Davis, of Fitzwilliam, New Hampshire, who was her maternal grandmother’s older sister. It had originally been a wedding gift to Marguerite’s parents William Aquilla Davis (1855 – 1911) and Hattie A. Haskell (Feb 6, 1858-1929). William Aquilla Davis (named, we suppose, for the Revolutionary soldier) was a New Hampshire granite quarryman who cut stone for the Library of Congress which, in 1897, was moved to a new building east of the Capitol. His initials are carved into the stone of the Library. Hattie had worked in Concord, Massachusetts as the paid companion to Louisa May Alcott (1832-1888), author of the book Little Women, prior to marrying William. This must have been in Alcott’s later years (though she was only 56 at her death) when she returned home from her work as a Union Army nurse in the Civil War and following the success of her book, Little Women, which provided her with the financial security to afford a paid companion. 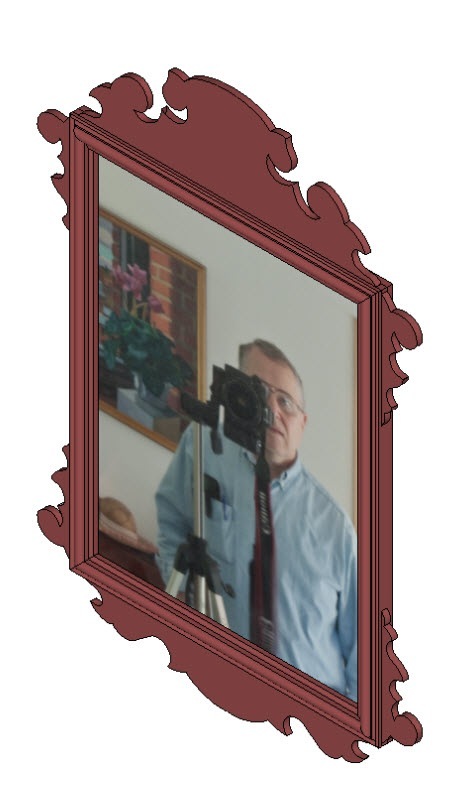 A picture of the original mirror is shown at left, above, with a reflection of me and my camera as I take its picture to form the basis of a Google SketchUp drawing. 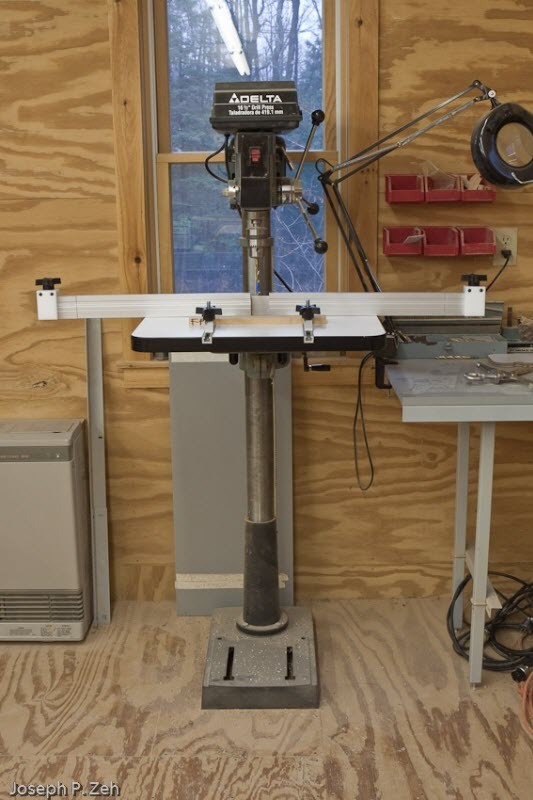 The first step in creating reproduction drawings was to import this photo into SketchUp and place it on its own layer. 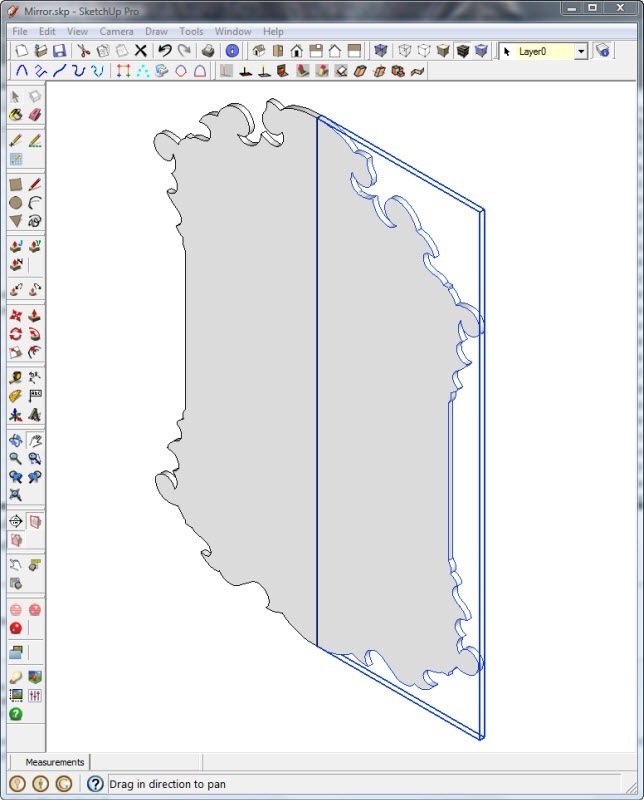 I carefully measured the real mirror’s overall width and height and created a rectangle in SketchUp with these same dimensions. 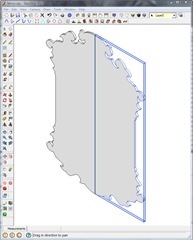 Next I scaled the picture until it fit precisely tangent to the rectangle’s edges. Looking at the picture it became obvious that a vertical line bisecting the rectangle would provide a line of symmetry that would be quite helpful. Lastly, using the Cubic Bezier Curve tool (a Ruby plug in) I traced the scrollwork. 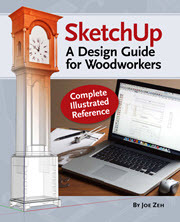 See “An Intermediate Google SketchUp Tutorial” Parts 3 through 5B on my Google SketchUp page if you are not familiar with this tool. The results are shown at right. 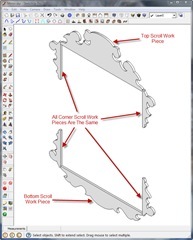 The scrollwork in the original mirror is 1/4” thick and seats in a grove (mortise) in the picture frame. Using the Push/Pull tool to give my tracing thickness and the Move/Copy & Flip Along context tools to complete the second half, I achieved a single scrollwork piece as shown at left. 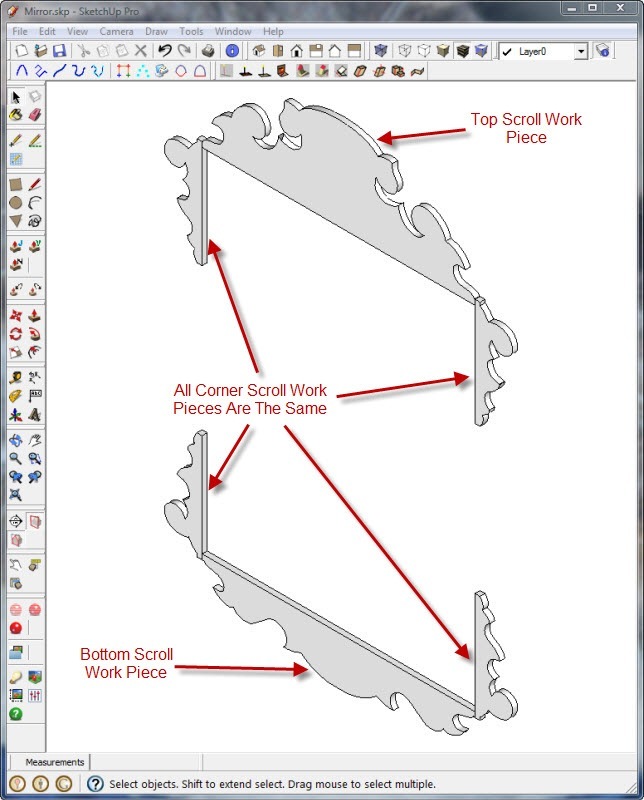 A quick study of this image reveals that all four corner scrolls are identical and that only three pieces are needed to complete the scrollwork. 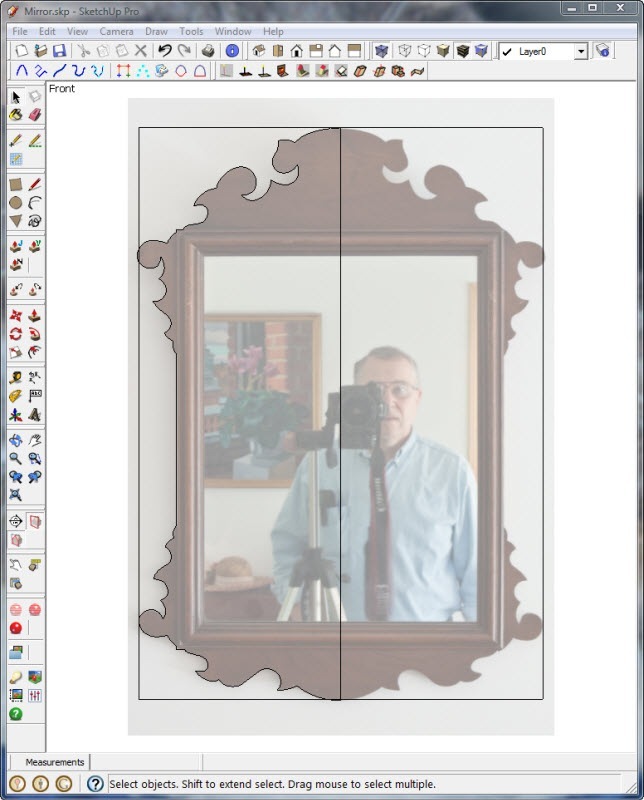 A few measurements taken from the picture above right, and the original mirror, allowed me to create three smaller components as shown at right. 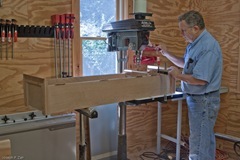 Notice that I added 1/4” tabs (tenons) to secure the scroll pieces in the slots (mortises) in the picture frame. The rest of the reproduction was rather basic. I carefully studied the original mirror’s picture frame and made measurement to reproduce the picture frame profile. I used the Push/Pull tool to create a basic component, and then created two more components with mitered corners; one for the vertical frame pieces and one for the horizontal pieces. 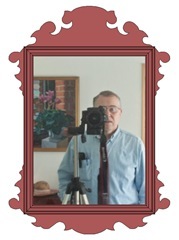 The mirror is a simple block with the picture textured on its surface. A completed SketchUp image, complete with a textured mirror, is shown at left. An Isomeric view is shown at right below. 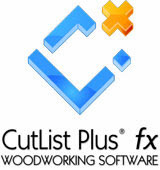 Now here is my gift to you; you can access a completed plan for this mirror, including a CutList Plus cut list, Excel cut list or Comma Separated Value cut list by clicking the below hyperlinks. You can change the mirror’s texture to put your own image on it. 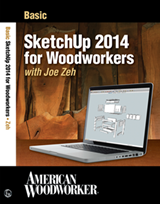 Some dimensioning still needs to be added to the model, but I assume you as a SketchUp user can do that yourself. Also, the texture on the wood is a simple color patch. 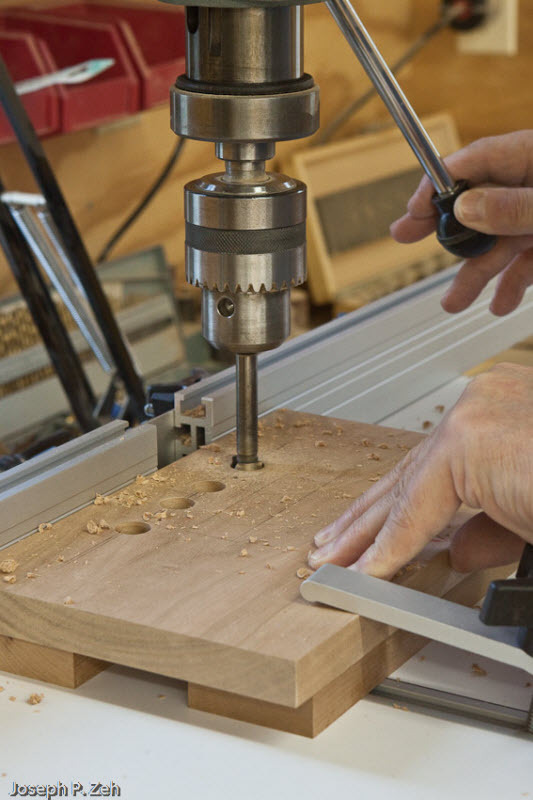 If you have a good .jpg image of, say tiger maple, you can use it to texture the wood with grain. 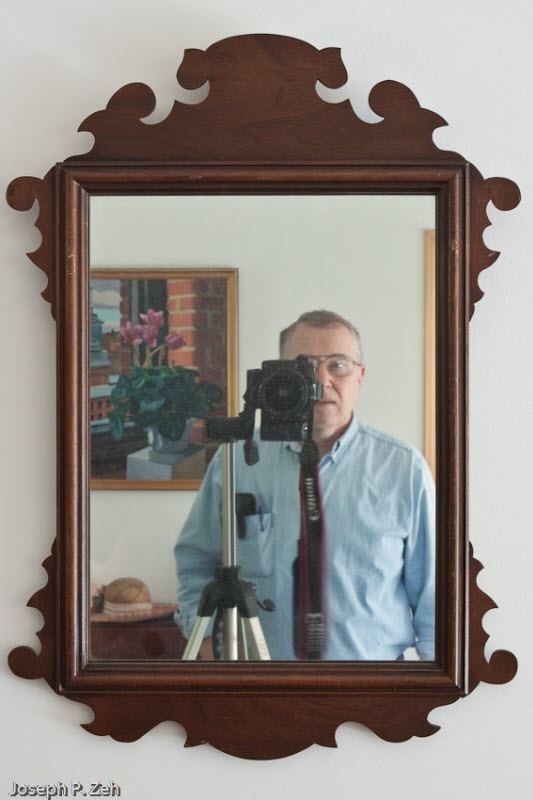 The mirror itself is 1/8” thick. The original was thicker, but significantly heavier. Otherwise this is an accurate reproduction. Lastly, the picture frame profile, though an accurate reproduction, my require bits you don’t have. Simply change the profile to your liking. If you choose to craft this mirror please send me a picture of your finished piece. 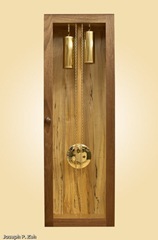 I promised my daughter that upon her graduation from law school I would give her a wall hanging Shaker style clock. She graduated in the spring of 2008. I completed this clock in October of 2009. A little late; but to keep anyone from finding out I printed 2008 on the clock dial. Pretty clever huh? 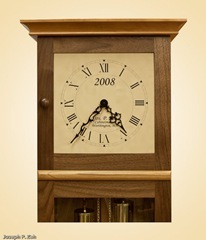 The clock carcass is cherry and though not visible is constructed with hand cut dovetail joinery. The back of the pendulum compartment is spalted maple which gives this relatively large area some interesting figure for eye appeal. To provide contrast the doors are made of walnut. In keeping with the Shaker theme the trim is simple bull nose and quarter round. Door pulls are turned "mushrooms" typical of what the Shakers would use. The clock dial was drawn using Google SketchUp. The four I’s to represent the numeral four is not a mistake. Though four is correctly represented as IV it is traditional in clocks to represent it as IIII. After drawing the clock dial in SketchUp I applied an antique texture behind the numerals to add a little "age". Next I printed the dial full scale on 13" X 19" premium card stock. To protect the dial I applied seven coats of Spray-On MinWax Satin Polyurethane with the added benefit of still more aging (it dries slightly yellow). Finally the card stock is glued to a plywood backing. 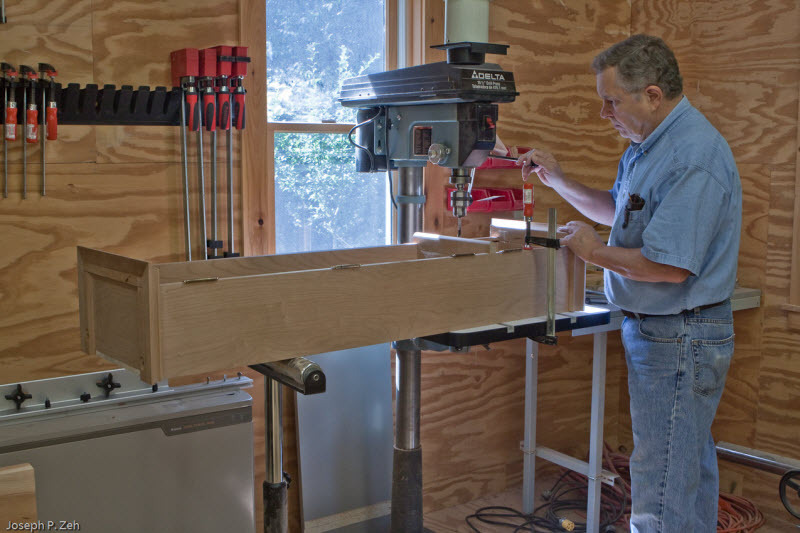 – Did he say plywood? 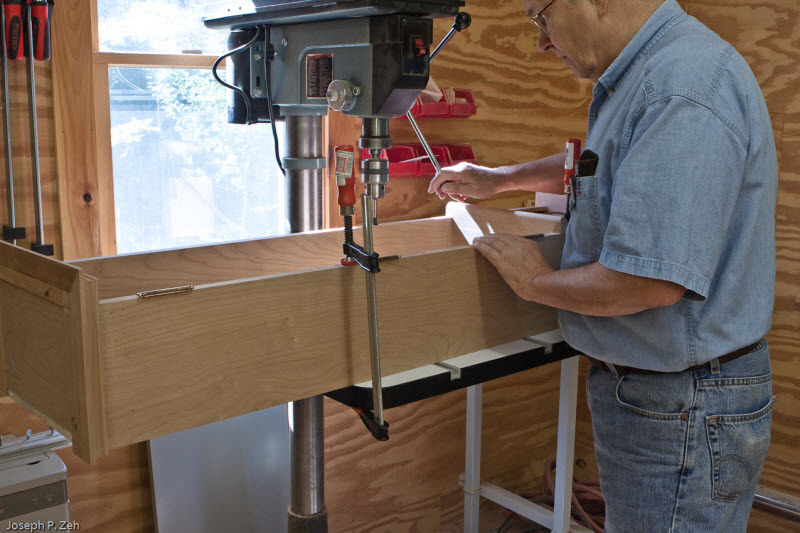 Yes, an extremely rare occasion when I use anything but hardwood in my projects. The mechanical clock movement is a German made Hermle model 241-080. 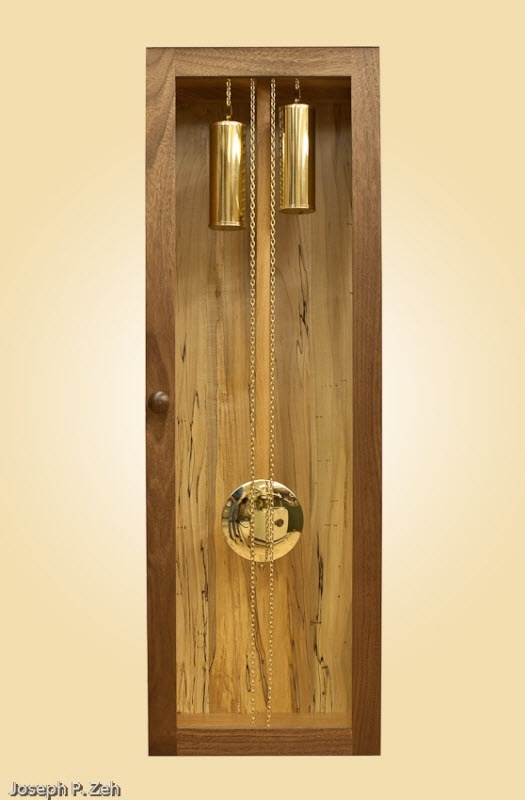 It is an 8-day movement with a gong that strikes once on the half hour and counts out the hours. 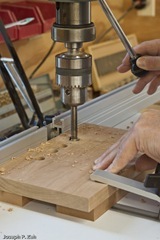 The serpentine hands are not in keeping with the Shaker style. Mother Ann would definitely not approve, but hey, my daughter likes them. The chains, bob and weights are brass plated. If you look closely at the bob you can tell these pictures were taken in my shop. The bob shows a reflection of me and my 15" planer. 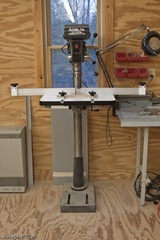 To complete this project I used non-mortising hinges and rare earth magnetic catches. 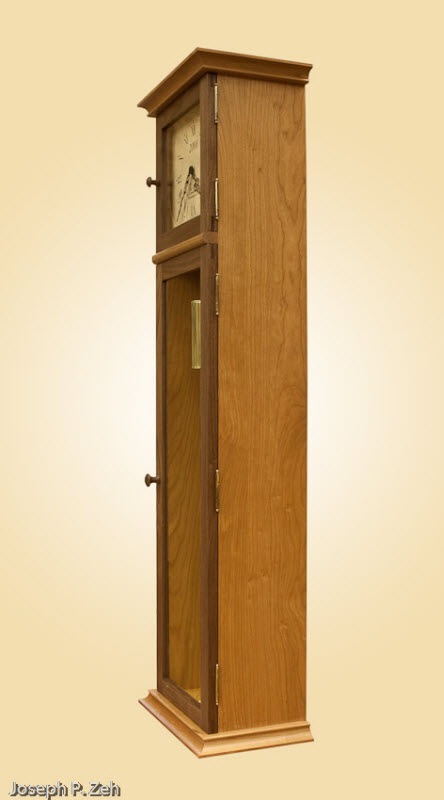 The hinges have an antique brass finish. To keep the clock level in the vertical direction I used two adjusting pins that have sharp points which dig slightly into the wall and can also be adjusted for level in the orthogonal vertical plane. 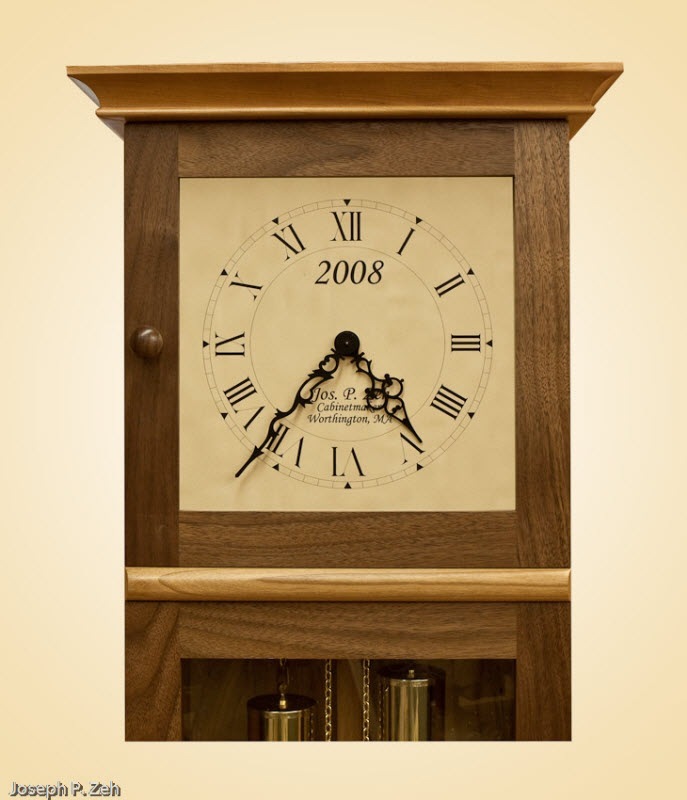 These pins are made especially for this purpose and are a traditional piece of clock hardware. I finished this piece with seven coats of hand rubbed MinWax Wipe-On Polyurethane Satin Finish.